Interestingly it will also include the lack of prices for ham. polony and vienna's due to Listeriosis. Since shops pulled it off the shelf Stats SA officials cannot collect prices for these goods. 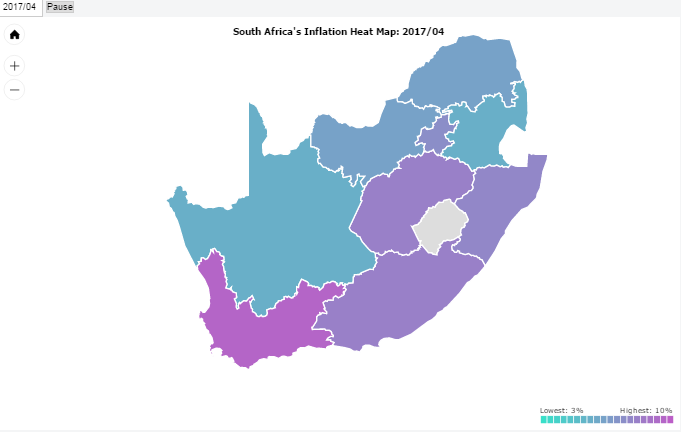 The interactive map below shows the inflation rate over time per province. The table below provides a summary of the latest inflation rates per province as well as the overall official rate of inflation for South Africa. While the majority of provinces have inflation rates lower than that of the official inflation rate, provinces which makes up a large portion of the overall spending in South Africa , such as Gauteng and Western Cape, have inflation figures above the national average. And as has been the trend in recent months, the Western Cape's inflation rate continues to outpace that of the other provinces. We really do feel for them as not only is their inflation rate the highest, but as we showed yesterday with this blog post, they pay on average the most per 330ml of beer.